Comments on Construction. This kit required a bit of filling and sanding of most parts to get a good fit. Fronts window made from Testor's Windowmaker, which is a thick white glue which dries transparent. Window wipers made from cut up bristles from a large paint brush. Other comments. As is common with Ace kits, the tracks are metal etch, and need to be heated to red hot for a count of ten, then allowed to cool, before trying to bend them around the running gear. The heating has a softening effect on the metal, allowing smoother curves to be formed. Also don't put any droop in the tracks, these were quite stiff rubber in reality and very few pictures show any sag at all. Comments on Construction Filling and sanding required for body joins. The kit does not come with the wire frame aerial, the kit instructions recommend you make your own from bent wire. Sounds easy but depends on the skill of the modeller. The kit comes with supports for the frame, which I chose to replace with cut down needles. In retrospect I would just use thicker gauge wire for the supports. Other comments. I used 0.44 gauge wire for the aerial. Kit also comes with road wheels if you choose to make it a 'road runner' in which case you cant mount the rail wheels on the body. 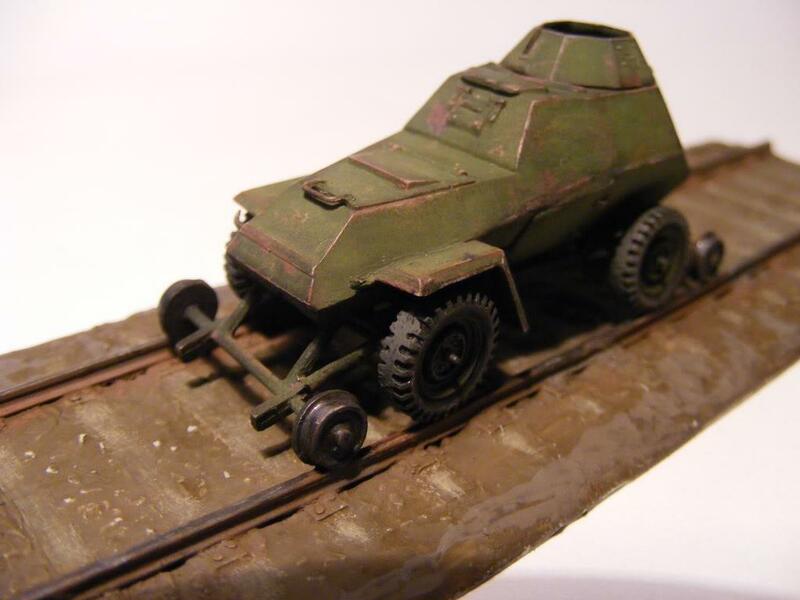 Kit comes with a length of railway road bed and track. Other Comments. This kit comes with the parts to make two rail versions - the 'G' model as per my build in the picture below, & the larger rail wheels that replace the road wheels to make the 'V' model. Both were experimental types from two different factories & not very successful. Given the kit has the rubber wheels you can always just make a standard BA-64 and put the rail gear into the spares box. This kit also comes with a length of railway base and track (as in picture below) but I replaced the rails with metal ones.